I wasn’t a particularly bad writer; I just never enjoyed it. That would not be terribly surprising for most kids, but my grandfather happened to be an author and happened to co-write one of the best screenplays of all time, The Graduate. Today, I am a writing machine. I have a personal blog, I write more than 50 articles a year for my business, and have written dozens more for Pursuit Magazine and for the Association of Certified Fraud Examiners, among others. What I’ve come to realize is that writing is one of the most important skills an investigator can have. When I first started, I was not terribly good at articulating those ideas. The ability to take a complex thought or idea and put it on paper is not something that we are all born with. As an investigator, it’s what we do, though. We take vast amounts of information and try to articulate that information in a concise, easy-to-digest format. Although I have had plenty of practice at it over the past 10+ years, my writing proficiency is still a work in progress. But writing continuously helps me get to where I need to be. What if I told you that you can have more than 50,000 people a year knocking on your door to inquire about your investigative services? Sound enticing? More than 20 percent of my business comes from the Internet. I expect that to rise dramatically over the next few years. What’s even better? Almost none of it is from my local area. It has opened my doors to the entire world instead of to a limited radius. I have never been a particularly good writer. I could put a few phrases together, but nobody ever called upon me to come up with a perfect sentence. And grammar is about my least favorite thing. When I first started writing I had about as much confidence as I do in the Mets’ chances of winning the World Series this year. (Not much, for those of you who aren’t sports fans.) I would have three colleagues read it before I would post it. Even then I’d be worried about what people thought. And another thing ... whatever is written is never going to be perfect, so you shouldn’t even try for that. I know a thing or two about investigations, but I am humble enough to know that I still have many moons to go before I am an expert in anything. The truth of the matter is, I don’t know any more than any of you do. The difference is that everything you know is in your head. The only people who know you are an expert are the people who communicate with you regularly. If even they do. When you write about something, the whole world can see it. Suddenly your reputation for expertise is spread by leaps and bounds. Like all investigators, I go through peaks and valleys. Periods of more work than you know what to do with followed by slow periods when you wonder when you are going to get your next case. It happens to every investigator. Writing is perfect for the slow periods. It keeps your mind fresh and ideas percolating and keeps you from worrying about your next case. I write furiously when I my workload is low. Blog articles, e-books, guides, etc. You name it, I write it. So when I am going through a busy period, I can still post blog articles that I have stashed away. And you don’t have to write only when you are slow. If I have an idea or learn something new, I write about it. Right then and there. I don’t know about you, but ideas stay in my head for about four and a half minutes. Start by writing about something that you know like the back of your hand. Use stream of consciousness. Don’t worry about making it perfect. Then, see where it takes you. Who knows? You may end up getting more business, becoming an expert or taking advantage of those slow periods. Or you may end up actually enjoying it like I do. 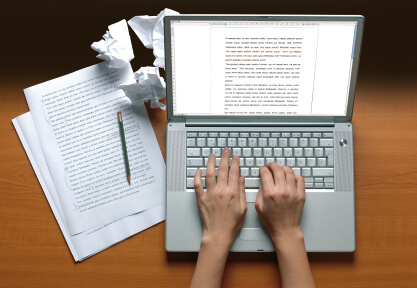 So stop wasting your time reading this article, and get writing! This article was written by Brian Willingham, a New York Private Investigator and the President of Diligentia Group. He is also #2 on the PInow list of Top Private Investigator Blogs.